Stimulus « America, You Asked For It! Telling the truth about President Obama’s administration and its policies tends to make enemies. But the good news for us on the right is this iconic member of the liberal media may be finally shaking itself out of its hypnosis where the Obama administration is concerned, and finally looking for the truth. “Ten months into President Barack Obama’s first economic stimulus plan, a surge in spending on roads and bridges has had no effect on local unemployment and only barely helped the beleaguered construction industry, an Associated Press analysis has found. Really? Isn’t that what we tried to tell them back when Obama, Pelosi, and Reid were pushing their $787 trillion spending bill? The AP even challenges the need for a second “stimulus” bill largely based on the same failed model as the first! It seems the news organization is no longer settling for the crumbs that fall in the wake of the omniscient oracle’s passing, because Obama is actively promoting this second round of spending. There may yet be hope, even for the MSM! With the failure of the Democratic approach to economic “stimulus” becoming ever more apparent, it’s time to look at the current recession from a different angle. This chart shows that unemployment actually began its steep ascent soon after Democrats took control of the House and Senate in 2006! Last month the libs leaped for joy when the July unemployment rate dropped to 9.4% from the previous month’s 9.5%. They proudly proclaimed the success of Obama’s so-called “stimulus” package and the turning of the tide of recession that had been washing across the land. The mainstream media (MSM) fell all over themselves proclaiming the success of Obamanomics and the inevitable, impending period of peace, love, and happiness in the US. Obama, his administration, and even the press seemed to forget that 9.4% was 120% of what he promised would be the peak unemployment rate if his “stimulus” was passed. And they blocked from their minds that the President had predicted a maximum unemployment rate of 9% if he wasn’t allowed to “rescue” the economy with his $787 billion payoff to left-wing special interest groups. Suddenly, 9.4% unemployment was deemed a blessing by the pens and keyboards of left-leaning journalists. Utopia was approaching, or…at least…that’s what they claimed. Next week, President Obama will place VP Joe Biden before the microphone to propagate his lies. Biden is set to report on the number of jobs “saved or created” by the “stimulus.” The “stimulus” bill was intended to “create or save” 3.5 million jobs by the time it was finally passed. Instead, our economy has shed 3.1 million jobs since the inception of Obamanomics. Still, the VP will take the stage to lie and claim the administration saved us from inevitable destruction. 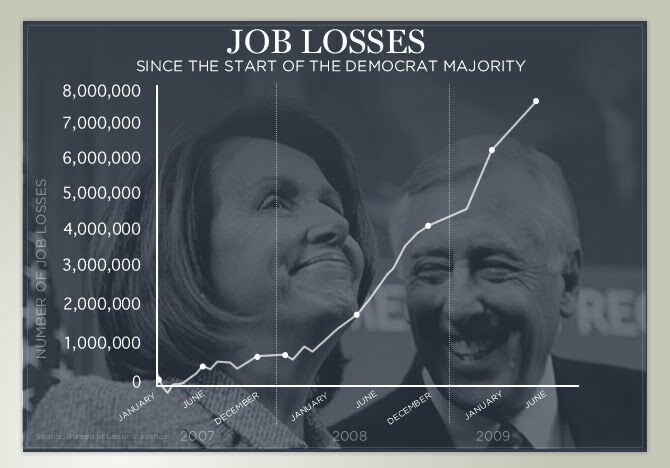 The graph above gives evidence the effect of the “stimulus” was a huge waste of money accompanied by a net loss of jobs. In fact, the only two sectors in which employment has been steadily growing since the “stimulus” was passed have been government and health care. Of course growth in government does little to actually improve the economy since the money to fund these jobs must first be taken from the economy. We can liken Obamanomics’ theory on economic growth to trying to fill a swimming pool by dipping bucketfuls of water out of one end, walking around to the other end, and dumping the buckets back in. According to liberal economic theory, the pool will miraculously become full! So for now, there’s only one segment of the economy functioning in a healthy manner. And we all know the plans Obama has for the health care industry. If the President has his way, the entire industry will be an arm of government. Libs probably think that will certainly cure it’s disease of remaining healthy while all around it become ill. The reality is Obama now wants to put the last remaining health economic sector under the knife. Not an exploratory surgery to discover why it’s still healthy, but a surgery to “fix” it so it functions like all of its sickly siblings. Luckily, Americans aren’t as stupid as the President thinks. More and more of those who voted for him are losing faith, standing up, and shouting this isn’t the change we wanted. Getting Screwed by Cash 4 Clunkers? Four days after it came to life, the allotted funds were expended. Our elected enlightened ones never expected so many to line up to take advantage of free cash from Congress. Wait a sec…could this be a parallel we’ll see if Obamacare comes to life? Let’s save that for another article. When I first heard of Congress’ Cash-for-Clunkers (C4C) scheme I didn’t like it, but for the wrong reasons. I guess I made the mistake of literally interpreting the word “clunker” in the title. Why I thought our government would be so transparent as to title their program to clearly communicate its intent I’ll never know. I wrongly assumed that scammers would rush to junk yards, pay a couple of hundred dollars for piece of junk, drag it or pull it to a dealer, and use it for a $4500 downpayment on a shiny new car. Voila! Scam the government. Well, it turns out the genius’ in Congress thought of that and included requirements to stop such abuses before they happened. But in the process, this intrusion into the free market, like all government programs intended to fix problems the government created, spawns several more catastrophes we’ll feel the effects of down the road. Let me start by saying I’m debt-free. My home, my cars, and everything else I own are paid for, free and clear. This didn’t come to be by luck or accident, but by sacrifice and well-laid plans. Thanks to C4C, a key strategy I employed in those plans will no longer be available to me or others who might wish to take a similar path in order to enjoy a life free of monthly payments and negative net worth. You see, the last new vehicle I purchased was in 1988. I was 21 at the time. Two years later I needed to sell that vehicle after enlisting in the Marines. I was upside down and had to pay an extra $300 to relieve myself of ownership of that ride. I swore that would never happen again, and it hasn’t. Since that day, I’ve never owed more on a vehicle than what it was worth. To avoid that undesirable predicament, I purchased older vehicles with high miles–that I could pay cash for. The first was a 1982 Ford Courier with just under 100,000 miles that I paid $700 for at a Southwestern Bell equipment auction. It was ugly as hell, but well-maintained. I drove it for two years, and taught myself to work on it. When the starter went out, I bought a book, some tools, a new starter, and replaced it. I sold this truck and bought a full-size 1980 Chevrolet pickup for $1500. It took me where I needed to go for two more years. I repeated this numerous times over the years and haven’t had a car payment for a vehicle on which I was the primary driver for the past 19 years. Thanks to the social engineers in DC, a life without car payments may no longer be possible after my current vehicle wears out. If this program is still in place (Remember the words of Ronald Reagan, “The closest thing to eternal life on Earth is a government program.”) when I’m in the market for my next car, it will artificially add $3,500-$4,500 to the price of every car I’d otherwise be interested in purchasing. At best, a comparable vehicle to one I’d have purchased a year ago with $2,000 won’t sell to a private buyer for less than $4,500. It won’t last me any longer than the one I’m driving now, but thanks to the government it’ll cost me more than 3 times as much to drive it. And the difference between paying $2,000 and $4,500 will force many to finance these cars when they could have paid cash if our intrusive government would have just let the market work. But $4,500 likely won’t touch one of these cars either, because our genius’ in Washington are also drastically depleting the supply of such vehicles. Though the cars taken on trade in the C4C program must be driveable, our government is mandating they be rendered inoperable and destroyed. So far, a quarter of a million driveable used vehicles have been taken off the road. The most basic law of economics, supply-and-demand, guarantees an increase in price will result from this program. These cars will no longer be worth buying at their government-inflated prices. That will leave me with the choice of buying even older cars or buying a new car. Of course, if too many people turn to buying those (really) old clunkers, that really are gas-guzzlers, I’m sure our brilliant social engineers in DC will change the rules to take away that option also. Eventually, that will leave me with no choice but a new vehicle that I’ll almost certainly be forced to finance. I’ve spent my adult life carefully plotting to keep from having a car payment. Silly me, I considered this responsible. Now the Socialist social engineers that run our government have identified folks like me as part of the problem. They’ve designed and implemented a scheme intended to strip from me the freedom of living life without car payments. They’ve determined that I no longer have the right to be debt free. That it’s only fair that I too am forced to purchase a vehicle that I’ll have to finance. After all, in our Obamatopia, if anyone must make a car payment, it’s our collective responsibility to share that burden. You see, if we’re all forced to buy new cars, the newly acquired taxpayer owned auto companies can continue selling unaffordable cars with affordable payments for a little while longer. In effect, by forcing me to buy a new car, it will lower the payment of those who got themselves over-extended by buying cars they couldn’t afford. You know, back to that spread-the-wealth thing Obama loves so much. The House of Representatives has already voted to spread another $2 billion of your wealth to help screw me and others like me over. This should take another half a million good, operable, used vehicles off the road and into the scrap heap. Luckily, the US Senate is balking at handing another $2 billion to the auto companies and taking the next step to permanently increasing the cost of new and used cars by $4,500. Senator John McCain (R-AZ) has threatened to veto any extension of the program and Senator Jim Demint (R-SC) says he’s weighing options and will fight if there’s a chance to stop it. But Republicans aren’t the only obstacles to expanding one more government giveaway to subsidize the American auto industry. Senator Claire McCaskill (D-MO) on Twitter tweeted today, “We simply cannot afford any more taxpayr $ to extend cash for clunkers. Idea was to prime the pump, not subsidize auto purchases forever.” Other Dems are opposed because they say the program doesn’t mandate enough increased fuel economy. Bottom line, if these Senators hold the line and refuse to make C4C a permanent program, and if I can make my 12-year-old car with 140K miles last another couple of years, I just might be able to keep living life without car payments. But not if President Obama has anything to do with it. Is it his insistence on imposing government-run healthcare on a leery populace? Or could it be that calling the cops stupid for arresting his loud mouthed friend? Just a few months ago, liberals were digging the grave for the conservative movement. Certain they’d permanently prevailed on the heels of Obama’s historic election, they set about ramming their Socialist agenda down the throats of all Americans in an attempt to bury conservatism forever. Using tactics more common among union thugs and other organized crime, they seized control of private industry, spent hundreds of billions on wasteful projects to line the pocket of special interests, and cut the legs from under an already staggering economy. All of this happened with virtually no support from Republicans in Congress. Liberals everywhere warned Republicans were further alienating themselves in the eyes of the American public, calling the GOP “the party of NO.” Some RINOs trembled with fear while those of us who truly believe conservative principles make our country stronger and more prosperous insisted the path back to victory wasn’t to fall in step with our liberal foes, but to charge headlong into the center of their ranks. Ignoring warnings from Dems and RINOs alike, real conservatives in the Republican party stood our ground and took the fight to the enemy. Rather than retreat we went on offense. It took a few months, but now we have them on the run! Blue Dog Democrats are feeling the pressure from their constituents and our constant bombardment of their complicity in quadrupling the national deficit to squander our hard-earned money on legislators’ pet pork projects. Harry Reid announced yesterday the Senate would not meet Obama’s mandate to rush a health care bill through Congress by the August recess. Then Obama stepped on his own land mine when he called a good cop stupid. Their battle plan is being shredded and their troops are beginning to desert! The best of news came today in the form of Rasmussen’s Daily Presidential Tracking Poll. I’ve been following this poll for a couple of months now and until today, Obama had always enjoyed a higher approval than disapproval rating. Today that all changed. For the first time in his Presidency, more likely voters in America disapprove of his job performance than approve. As of today, 49% approve and 51% disapprove of Obama’s leadership. It looks like America wasn’t ready to swallow Obama’s “change” after all. I’m sure that’s how the MSM and the White House will spin it anyway. But the reality is, 16 states now have double digit unemployment. You know, all those “saved or created” jobs just haven’t materialized like the President promised they would. Michigan is hardest hit with the highest unemployment rate any state has seen in 25 years at 15%. Boy, that auto bailout really saved Detroit didn’t it? 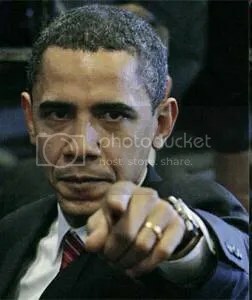 Just to remind everyone, Obama and Co. predicted the unemployment rate would never top 9% and it wouldn’t reach that point until the first quarter of 2010. Of course, Biden now claims they had no clue what they were doing when they made their predictions, because last month the rate reached 9.5%. That’s right, post-“stimulus” unemployment is higher than it would have been without the stimulus! Now the administration wants you to believe they weren’t pessimistic enough about the state of the economy when Bush left office. But what I see in this graph is evidence that the “stimulus” didn’t stimulate, and in fact made things worse. That’s right, Obama’s stimulus plan made unemployment worse than it would have been had the Democrats not wasted the trillions of dollars. The economy has lost over 2 million jobs since Obama’s “stimulus” was signed into law. Last I remember he was promising it would “save or create” 4 million jobs. Recall he rammed the bill through Congress, claiming any delay would leave the economy in ruins. Most Senators and Congressmen never even read the bill. And what we got was a bill that wasted hundreds of billions of dollars that actually had a negative impact on the economy! Sixteen states with unemployment over 10%, double-digits. This is the change Obama brought! *I just found an earlier version of this post on Pride of America dated 2/20/09. The Exxon Valdez oil spill was not a large one in relation to the world ‘ s biggest oil spills, but it was a costly one due to the remote location of Prince William Sound (accessible only by helicopter and boat). 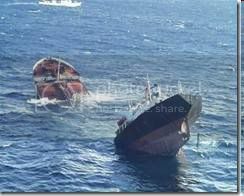 On March 24, 1989, 10.8 million gallons of oil was spilled when the ship ‘ s master, Joseph Hazelwood, left the controls and the ship crashed into a Reef. 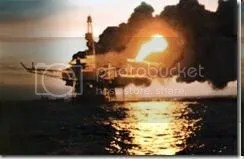 The world ‘ s worst off-shore oil disaster. At one time, it was the world ‘ s single largest oil producer, spewing out 317,000 barrels of oil per day. On July 6, 1988, as part of routine maintenance, technicians removed and checked safety valves which were essential in preventing dangerous build-up of liquid gas. There were 100 identical safety valves which were checked. Unfortunately, the technicians made a mistake and forgot to replace one of them. At 10 PM that same night, a technician pressed a start button for the liquid gas pumps and the world ‘ s most expensive oil rig accident was set in motion. Within 2 hours, the 300 foot platform was engulfed in flames. 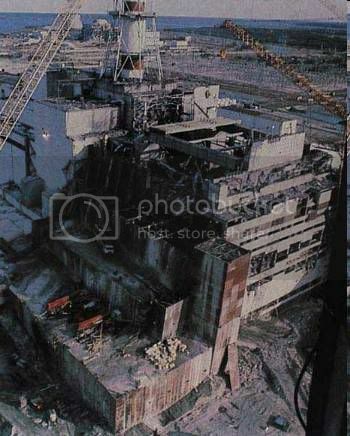 It eventually collapsed, killing 167 workers and resulting in $3.4 Billion in damages. 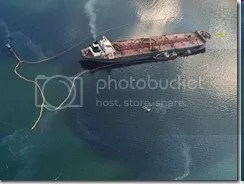 On November 13, 2002, the Prestige oil tanker was carrying 77,000 tons of heavy fuel oil when one of its twelve tanks burst during a storm off Galicia , Spain . Fearing that the ship would sink, the captain called for help from Spanish rescue workers, expecting them to take the ship into harbour. However, pressure from local authorities forced the captain to steer the ship away from the coast. The captain tried to get help from the French and Portuguese authorities, but they too ordered the ship away from their shores. The storm eventually took its toll on the ship resulting in the tanker splitting in half and releasing 20 million gallons oil into the sea. According to a report by the Pontevedra Economist Board, the total cleanup cost $12 billion. The Space Shuttle Columbia was the first space worthy shuttle in NASA ‘ s orbital fleet. It was destroyed during re-entry over Texas on February 1, 2003 after a hole was punctured in one of the wings during launch 16 days earlier. The original cost of the shuttle was $2 Billion in 1978. That comes out to $6.3 Billion in today ‘ s dollars. 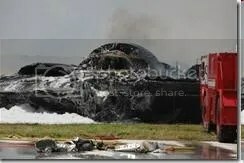 $500 million was spent on the investigation, making it the costliest aircraft accident investigation in history. The search and recovery of debris cost $300 million. 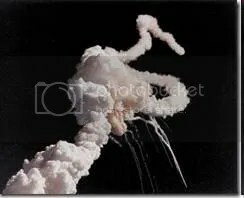 In the end, the total cost of the accident (not including replacement of the shuttle) came out to $13 Billion according to the American Institute of Aeronautics and Astronautics..
# 1. 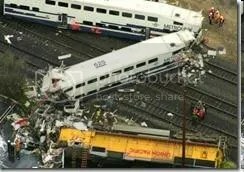 2008 Presidential Election – Clearly the WORST DISASTER in the history of the United States! $800 Billion in the first two months………..
And the cost continues to grow! WASHINGTON — Around midnight on April 15, 1912, there were a few minutes when Capt. 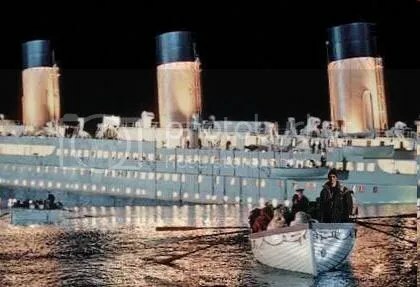 Edward Smith of the Titanic realized his ship was going down — six watertight compartments breached, less than two hours to float — yet his passengers slept in happy ignorance. A historical fate hardened while most of the participants dreamed on. 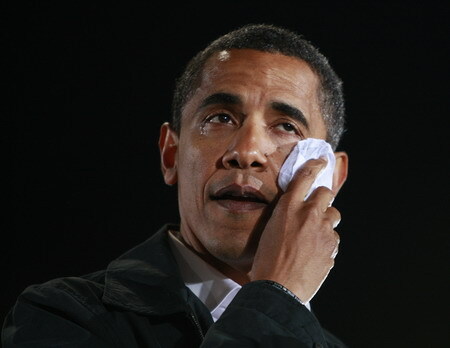 The jobs report last week opened a long gash beneath the waterline of President Barack Obama’s legislative agenda. Few yet realize it, but a scramble for lifeboats is about to begin. On closer inspection, the economic news, which seemed bad, is even worse. Not only did unemployment rise to 9.5 percent but wages fell, undermining the consumption needed for the recovery of a consumption-driven economy. Unemployment increased among “breadwinners” — married men and women who head households — also making major family purchases more difficult. Recent increases in unemployment benefits and food stamps have helped many Americans pay for food and rent. Jobs, however, are what lead to the purchase of furniture, cars and homes. Paired with a decline in business investment, these trends make a second-half recovery less likely. How’s the stimulus working for you so far? Well now. Our economy is really lunging forward, isn’t it? What a ride! Are you holding on? We’re billions of dollars further in debt (trillions?) and the economy is still stagnant. TARP, the stimulus bill, massive debts our children and grandchildren will have to pay .. and what has this all brought us? Banks aren’t lending, businesses aren’t hiring – let along expanding – and consumers aren’t buying. Oh, to be sure, the malls are crowded. Turn up the thermostats and see how long that lasts. Those aren’t shoppers, they’re just your neighbors trying to stay cool while watching the latest absurd teen fashion and freak shows. Do what the initials SNAFU mean? That word was created to define government action, or inaction as the case may be. In 1942 Time magazine carried this revelation: “Last week U.S. citizens knew that gasoline rationing and rubber requisitioning were snafu.” Well .. if there was ever a SNAFU, our economy would fit the description. To fully understand this, you have to know what the acronym stands for. Go ahead … Google it.